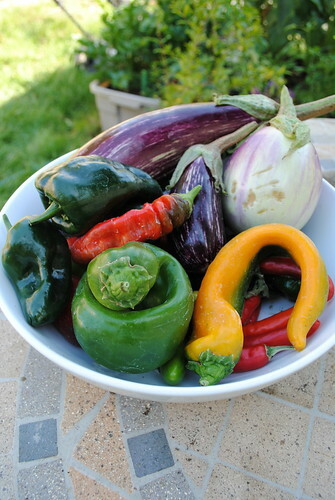 It’s that time of year where I need to say good by to the summer vegetables. The majority of summer plants peaked a while a go but a few are still hanging around. The majority of them are an overgrown mess. I’m going to have to show some tough love and rip them out. Varieties: Enchantment, Great White, Amish Paste, San Marazano, Green Zebra, Gypsy, volunteer cherry tomato and Purple Cherokee. Winner: Purple Cherokee. 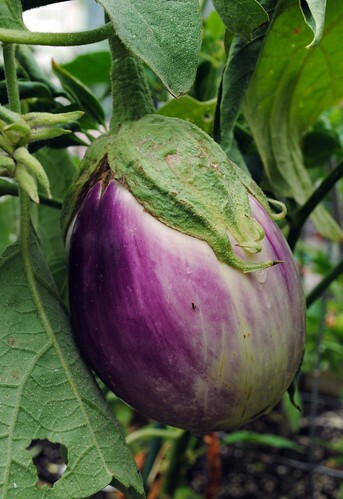 This is my favorite heirloom variety but it doesn’t always produce well. This year it was quite happy. 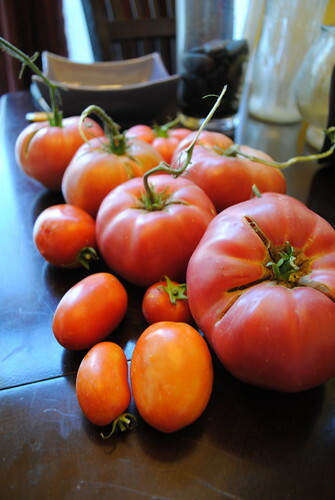 It produced beautiful tomatoes throughout the summer ranging from 1 to 3 pounds each. Losers: Great White tomato- I grew this accidentally last year and it quickly became one of our favorites. I tried growing it by seed without any luck and later with established plants from two different nurseries. I grew it in pots, the ground and in the Earth trainer but it still was not happy. We got a total of three tomatoes throughout the whole summer. Varieties: Tacoma pole green bean, Purple Bush Beans, Scarlet Runner and the new to me Dragon Tongue beans. 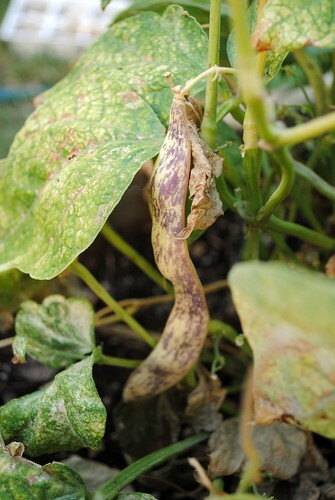 Winners: Three way tie between Tacoma Pole beans, Purple Bush Beans and the Dragon Tongue Bush beans. All three produced a prolific amount of beans. At one point it was difficult to keep up with them all. I like to saute the three together. The purple ones let you know they are done by turning green when you cook them. Losers: Scarlet Runner Beans are pretty but really should just be grown as an ornamental. It didn’t produce enough edible beans for me to keep it around for very long. Varieties: Market Cucumber, Zephyer Yellow Squash, Sweet Dumpling Squash and Golden Midget Watermelon. Winners: Market Cucumber produced beautiful tasty cucumbers throughout the summer. I find I only need to grow one plant as I’ll get overwhelmed by cucumbers if I grow multiple plants. Loser: The Sweet Dumpling Squash was a victim of bad placement and fickle weather. Unlike last year it didn’t produce a single edible squash. This is my first year growing watermelon successfully. To keep community garden thieves at bay I grew a yellow variety. It produced about five ice box sized melons in the beginning of summer. They were a little juicy but it contained a lot of seeds. I’m on the fence about growing next year. Varieties: Casper, Rosa Bianca, Black Beauty, and Listada De Gandia. Winner: Listada De Gandia was a new to us variety. 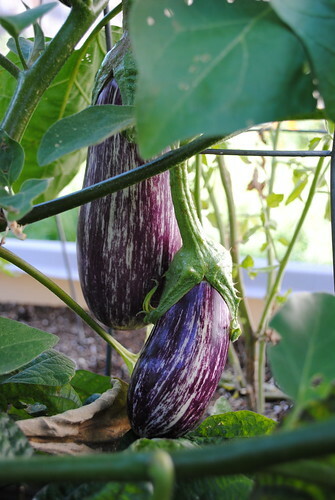 It produced an abundance of long cylinder purple and white striped eggplants. It’s still going and it’s almost Thanksgiving. Corno di Toro Giallo, Jimmy Nardello, Poblano and Yolo Bell Pepper. I really enjoyed the Corno di Toro Giallo peppers. They made these large, yellow peppers that were great in stir fries and in pastas. The name translates to Bulls Horn since they curl up and look like a horn when they are mature. They lack the green bitter taste of other sweet peppers. Loser: Yolo Bell Pepper just didn’t produce for the second year in a row. 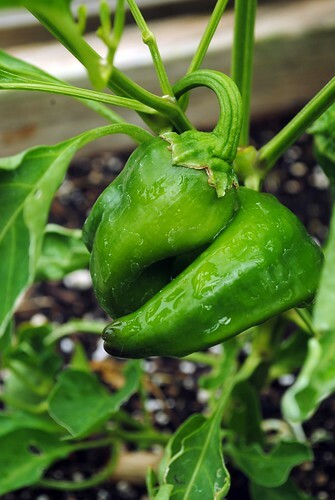 In the end I had only two mature peppers from this plant. It might be a victim of bad placement. It’s named after the county I live in so I feel like I might give it one more chance next year. Varieties: Fish pepper, Fresno Pepper, Black Prince and Ghost pepper. Winner: Wow, we really loved the Fish Peppers. I noticed a lot of good buzz about it through blogs like You Grow Girl and In the Garden Online and thought it would worth a try. The plant itself is pretty with yellow and green varieted leaves. The peppers go from green and cream colored to orange and then red. They provide a nice spice smoky flavor great for thai food and barbeque. 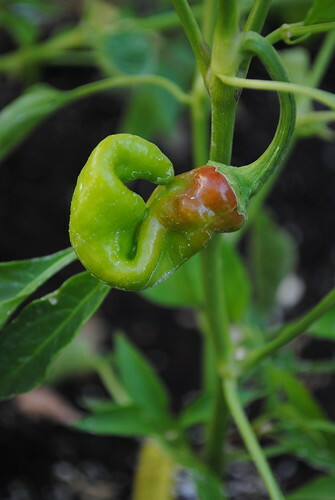 I grew the hottest pepper in the world aka the Ghost Pepper but I chickened out and never used it. As an ornamental plant it’s actually quite pretty with big bushy leaves and bright red orange peppers. I might plant it by the entrance of my community plot next year to scare any produce thieves. Happy Halloween! Past, Present and Surprise!